Canonical gave a first glimpse at Unity, a desktop environment designed with netbooks and touch-based devices in mind, and Ubuntu Light, a fast-booting version of Ubuntu. Unity includes a revised panel and application launcher which makes it easier to access most-used applications. Alongside Unity, Ubuntu announced Ubuntu Light, a 10-second boot implementation of the popular Linux distro that gives users an 'instant-web' experience. 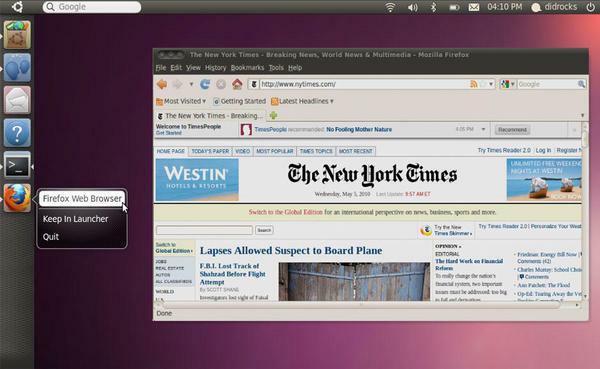 Ubuntu Light comes equipped with chat, media player, Web browser, photo-viewing and IM applications. The operating system is intended to be part of a dual-boot system for commercial PCs, but can run fine on its own. Unity and Ubuntu Light complement each other in that both the desktop environment and operating system offer simplified, but functional versions of the traditional Ubuntu environment. Ubuntu Light is available to PC OEMs by contacting Cononical directly at oem@canonical.com. Unity is already available for Ubuntu 10.04 LTS can be downloaded here.